OTISS supports BS5837:2012, “Trees in relation to design, demolition and construction – Recommendations“. OTISS can greatly assist Arboricultural Consultants when carrying out surveys and preparing reports on planned developments. On-site data collection and photos using the BS5837 Survey app on your Android phone, tablet or GPS device. Simple maps to show crown spread or RPA (no CAD needed). CAD drawings for you to adapt and tailor with your CAD application for full range of plans. With OTISS you can record all the information you need, and quickly process it into data tables and charts to be encorporated into a final report – saving you time and effort on data-entry and report preparation. Quickly export the tree data into your own CAD application where you can produce a full range of plans. An online, web-based system combined with the BS5837 Survey Android™ application for on-site data collection. A complete BS5837:2012 survey form with all the required fields, measurements and calculations. Automatic calculation of RPA. Additional set of user defined fields that can be customised (or omitted) to suit the requirments of each client. User defined picklists of standard items for all fields. 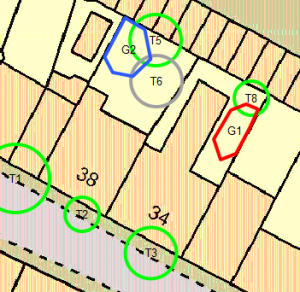 Online maps and colour coded icons based on the BS5837 retention category. Plot directly onto your own site plans, architects plans, CAD DWG drawing, Ordnance Survey maps, OS Mastermap, topography plans, geo-referenced maps or aerial photos. 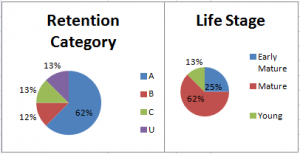 Predefined and tailored Excel charts and data tables for you to encorporate into your final report. Generate CAD/DXF drawings showing location, reference, species, category, crown spread, RPA and shadow arc. Or import the survey data into AutoCAD utilities such as KeyTREE and ArborCAD. A complete BS 5837:2012 survey form with additional sets of user defined fields that can be customised to suit the requirments of each client. 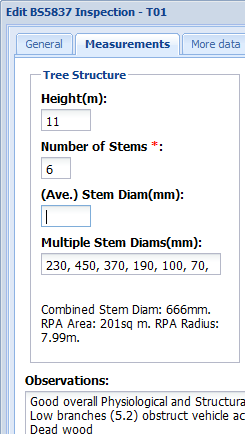 Automatic calculation of RPA – including multiple stem diameters. NHBC data on expected mature height of each species. Inspections can be entered directly onto the website or can be carried out using your mobile phone or tablet. 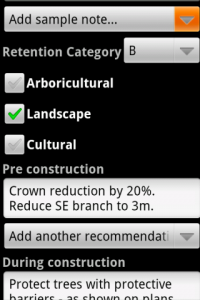 With the BS5837Survey Android application, you can view, update and create new trees – view screenshots. The maps, photos and data are synchronised between OTISS and your phone. The inventory that was built up during the surveys can be viewed and updated from any Web browser. OTISS provides a set of several hundred Common Tree Species. For each estate, you can add your own Estate Tree Species. We are looking at features whereby OTISS will be able to store photos and other documents relating to each tree. The trees can also be displayed using site plans you supply, as well as the online maps (e.g. Open Street Map). The web map view and the BS5837 Survey Android app both provide very easy ways of adding new trees. Simply click on the map and enter the information you have available. All icons are colour coded icons based on the BS5837 retention category (using the BS5837 defined colour set). The icon size shows the crown radius or the RPA. In OTISS we show the standard RPA and average crown radius on our maps. But we also generate a CAD/DXF file, that you import it into your CAD application. In CAD you can see the asymmetric crown radius; carry out detailed changes to the RPA; and add extra details for protective fences and ground cover. The trees can be plotted onto a CAD drawing and exported as a DXF file. For each tree, the drawings shows location, reference, species, retention category, crown spread, RPA and shadow arc – using the BS5837 defined colour set and calculations. The DXF file is intended to be opened by your own CAD application and merged with your existing CAD topp/site plan. More information on the BS5837 CAD/DXF drawings. 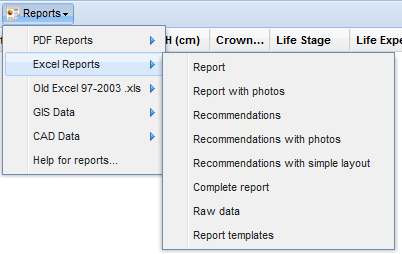 Alternatively, import the survey data into AutoCAD utilities such as KeyTREE and ArborCAD.